This is an excellent product which allows you to work anywhere and on any surface, from carpet to glass there is no surface this mouse cant use. It uses USB rechargeable batteries from a tiny USB receiver. It has some great features including its design and shape to help minimise RSI, strain on your wrists. We suffer from this (over worked) and we can tell you this does help massively. It has many buttons you can customise and a cool button which stacks all the open windows next to each other. 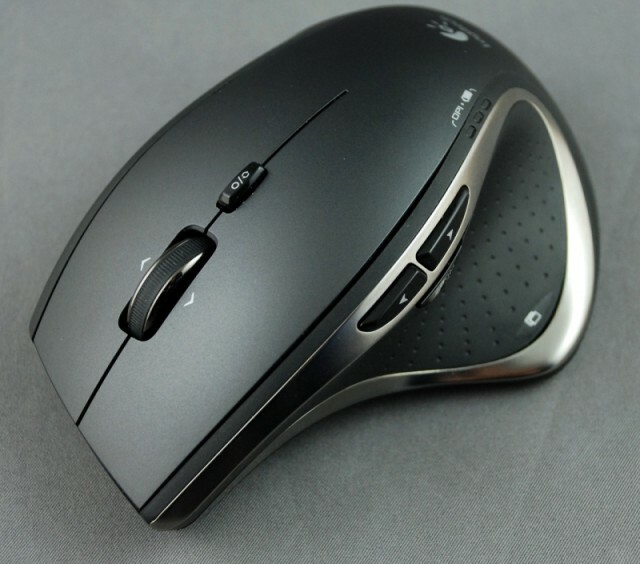 When clasping the mouse you will notice the expensive feel to the materials used, including the rubber texture where the thumb rests. All buttons are easily accessible and there are over 7 of them including scroll with multiple functions and speeds. The product is certainly at the higher end of the market, a similar Microsoft model is good but it really doesn’t compare to Logitech’s product. It is expensive, but we feel Logitech have really produced an excellent well thought out product, using excellent cutting edge technology including the darkfield laser. We certainly recommend this to anyone who is looking for a mouse that is top of the range, or if you suffer from RSI.